With organic chemistry finals just around the corner, you are likely reaching a breaking point with regards to the sheer volume of reactions and reagents you are required to master. And while my primary suggestion will be to ‘learn, study, and understand’ the reactions, you may find yourself overwhelmed trying to organize your notes and study material. 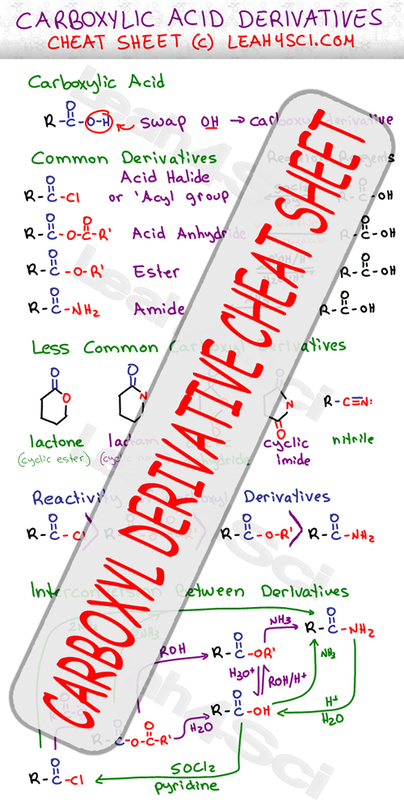 And so I’ve created this cheat sheet to help you keep track of the different carboxylic acid derivatives, their reactivity, and the modes of inter-conversion between groups. A great deal of effort went into this cheat sheet, so if you find it helpful please let me know by leaving a comment below, and sharing using the social media icons above. See the Video Summary and Overview below the cheat sheet!! Excellent materials! I’m going to sign up for your online study hall. What is the technology that you use to make your online presentations?